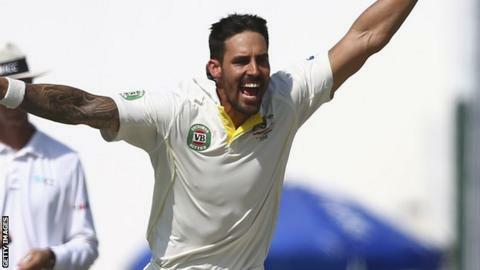 Australia fast bowler Mitchell Johnson has been named both the cricketer of the year and Test cricketer of the year by the International Cricket Council. Johnson, 33, also won cricketer of the year in 2009 and is only the second player after Ricky Ponting to win the Sir Garfield Sobers Trophy twice. England batsman Gary Ballance won the emerging cricketer of the year award. England wicketkeeper-batter Sarah Taylor was named the women's one-day international cricketer of the year. During the voting period between 26 August 2013 and 17 September 2014, Johnson claimed 59 Test wickets at an average of 15.23, with best bowling figures of seven for 40 runs against England in Adelaide last December. He is the third Australian after Ponting and Michael Clarke to win the Test cricketer prize. In one-day internationals, Johnson took 21 wickets in 16 games. "I'm very happy with where I am at the moment and I want to keep getting better as a cricketer," he said. Sri Lankans Kumar Sangakkara and Angelo Mathews were nominated for both awards. Yorkshire left-hander Ballance, 24, made his Test debut in January in the final match of England's 5-0 defeat in Australia. He scored a century in his first home Test against Sri Lanka at Lord's and made two other hundreds and three half centuries last summer. England Women's captain Charlotte Edwards missed out on the people's choice award, which went to India seamer Bhuvneshwar Kumar. Stuart Broad and Joe Root were named in the Test team of the year, but no England players featured in the ODI XI. Englishman Richard Kettleborough claimed the umpire of the year for the second consecutive year, while England pace bowler Katherine Brunt won the spirit of cricket award. Brunt ran out South Africa's Matshipi Letsoalo in a Twenty20 international in September but called her back and told the on-field umpire she was not sure if the ball was definitely in her hand when she dislodged the bails. Having checked the television replay, the third umpire subsequently reversed the decision and Letsoalo continued her innings.